While my idea of a successful run is extremely attainable– complete the course with no lingering pain and a smile on my face– I find winter training more difficult due to limited sunlight and colder days. This particular event offers both half and full marathon options, and there is a sign at packet pickup stating that marathoners may convert to the half simply by running the shorter distance. It’s that easy. Given that the half provides marathoners a bailout option, it creates a bit of a personal dilemma when game day arrives and I’m wondering about the adequacy of my training. Doubt and the possibility of stopping halfway creep into my mind. My body was loose and fresh as I ran the 1.5 miles to the starting area, and for the first half of Saturday’s run I felt great. It was a PERFECT day (still not sure how that happened) and I conserved energy by staying calm and avoiding the urge to surge around others. Marathoners run most of the first half with those running the shorter distance through Northeast and Northwest, and we then carry on to complete the second 13.1 miles in the Southwest and Southeast quadrants. 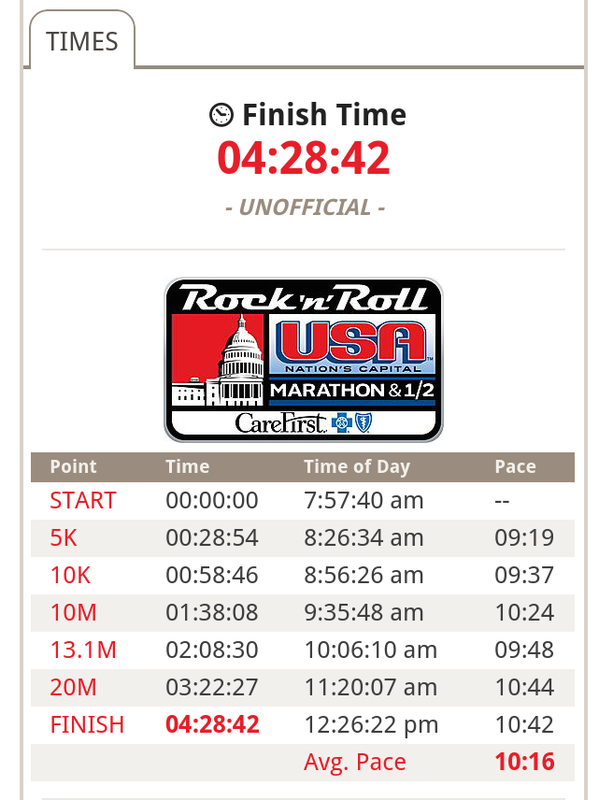 In addition, the route passes by my house at mile 16.5. Yes, that’s right. Mile 16.5. 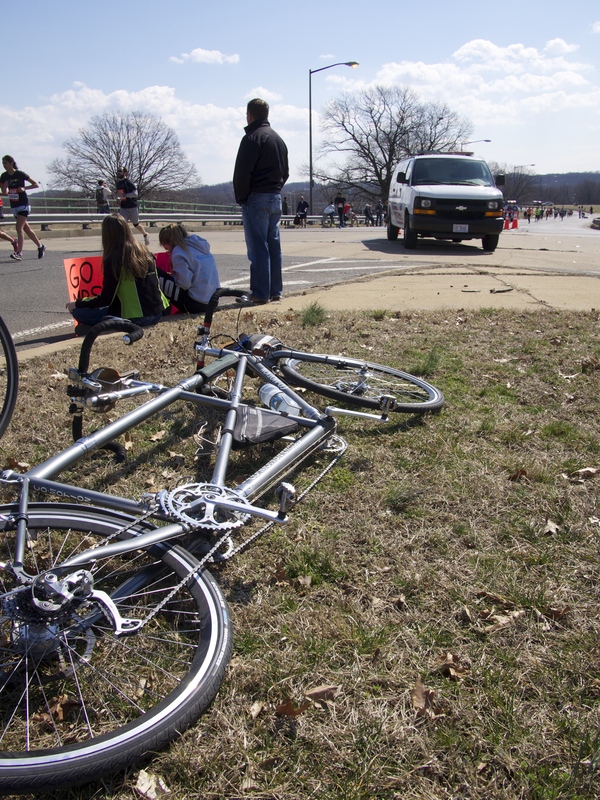 The course’s beginning miles follow roads frequently used on other local events. 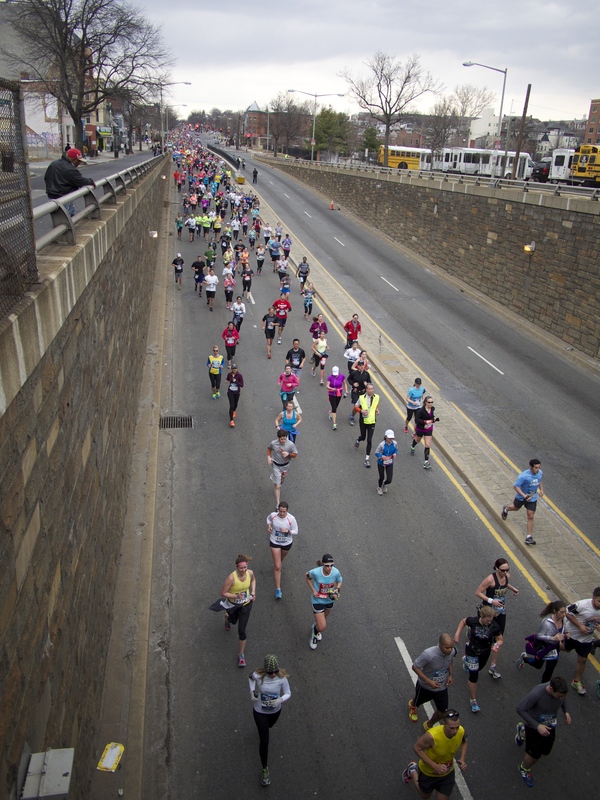 Constitution Avenue, Memorial Bridge, and Rock Creek Parkway are all part of the greatest hits of D.C. runs. I most enjoy this marathon when it extends into parts of the city where organizers don’t usually route events. We climb away from Rock Creek up to Calvert Street and enter Adams Morgan, the neighborhood where I first lived when I moved to D.C.
Tromping up Columbia Road and the steady incline along Harvard Street is great fun. It’s super lively and people provide excellent encouragement. Another highlight of the first half is the section along North Capitol over to H Street in Southeast. These areas have undergone so much change recently; it’s interesting to run by them and see the differences in the neighborhoods. The time came to make the split for the second half and I knew I was well-conditioned to continue. No bailout on this day. 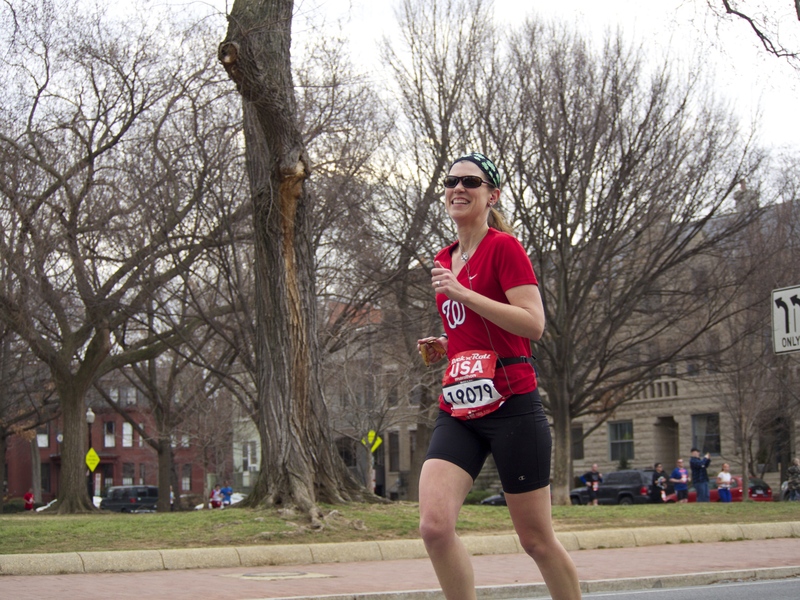 Another favorite segment ensued as I glided down Constitution past the U.S. Capitol. However, at mile 14 or so I started thinking about how I had finished at the halfway point the year before and wouldn’t it be great if I was off to brunch right this minute instead of still running. Felkerino, who was riding around to support me, met me and that lifted my spirits (he was the best cheering section a person could wish for throughout the event). I put my negative thoughts aside for the moment and continued through the 9th Street Tunnel (I don’t know why I think it’s fun to run through there, but it is), and we runners steadily padded our way along… toward my house. Felkerino met me again as I passed our complex (as previously noted, mile 16.5. 16.5!). I don’t remember saying this, but I apparently told him, “I am really gutting this out.” It is not characteristic for me to say those kinds of things, but it shows what a mental struggle this run had become. I really wanted to quit at my house. However, I had told a few people at work that I was running the full marathon and did not want to show up Monday not having met my stated goal. Also, since the only real thing that plagued me at that moment was a bad mood, I was obliged to continue. Going by the Canadian Embassy before the 9th Street Tunnel. I don’t feel so great here, but it’s not Canada’s fault. We ran by the Waterfront and Ft. McNair, a couple pretty parts of Southwest. We then turned by the salvage yard and the cement plant (not so pretty, in case you’re wondering), over the bridge on South Capitol Street (which is fun in its novelty, but a tough surface for the feet) and on into Southeast. This part of the course is really lovely because you run more than two miles through the open green space in Anacostia Park. However, it is also a fairly solitary section so you don’t get a lot of energy from spectators. And if you have read any of my previous run reports, you know I love spectators at marathons because they cheer like crazy and tell you all “Good job!” and say that you are awesome. This solitude gave me plenty of time for reflection. 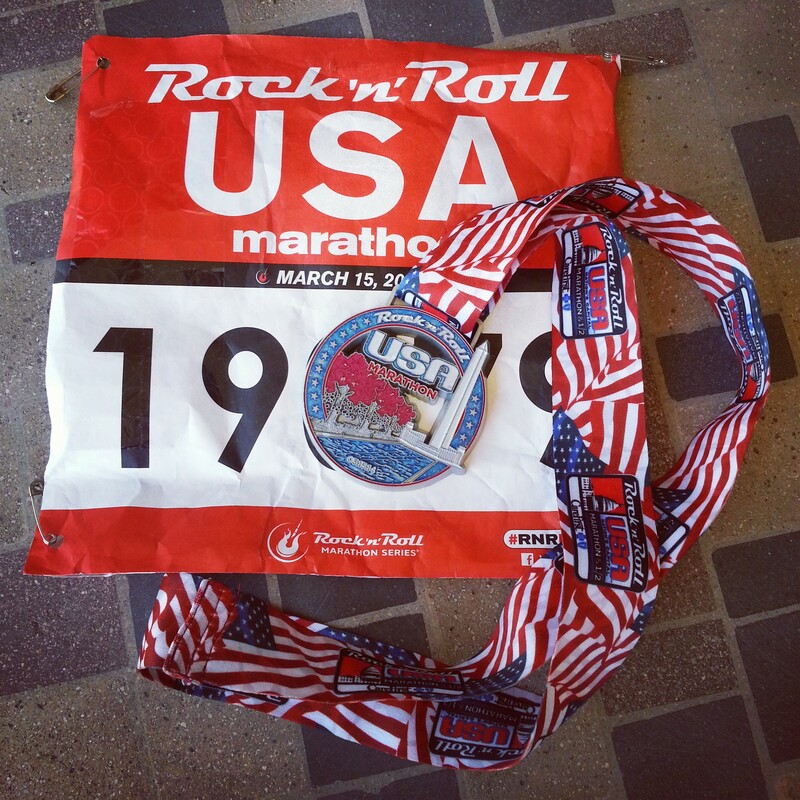 I reflected on how all the half-marathoners were probably out wearing their finisher medals and eating brunch, laughing and talking about how awesome their runs had been. I thought about how they were so smart to stop when they did. What kind of fool was I to think that the full marathon distance was a good idea? Then I became completely annoyed with myself for having such an extended low point. I asked myself what else I would want to be doing Saturday morning. I could not think of anything. Okay, maybe brunch, but brunch could wait. The day was absolutely perfect. In the 60s, by the late morning. We even had sun! I was running in shorts. What was the problem? I then evaluated what was really hurting. My calves were tight. Other parts on my body felt tight, but nothing was in an unmanageable state of discomfort. Conclusion? My low point was truly mental. These ruminations led me to lose count of my mileage and I passed the next mile marker, which read 22 and not 21, as I had thought it would. It was a marathon miracle! 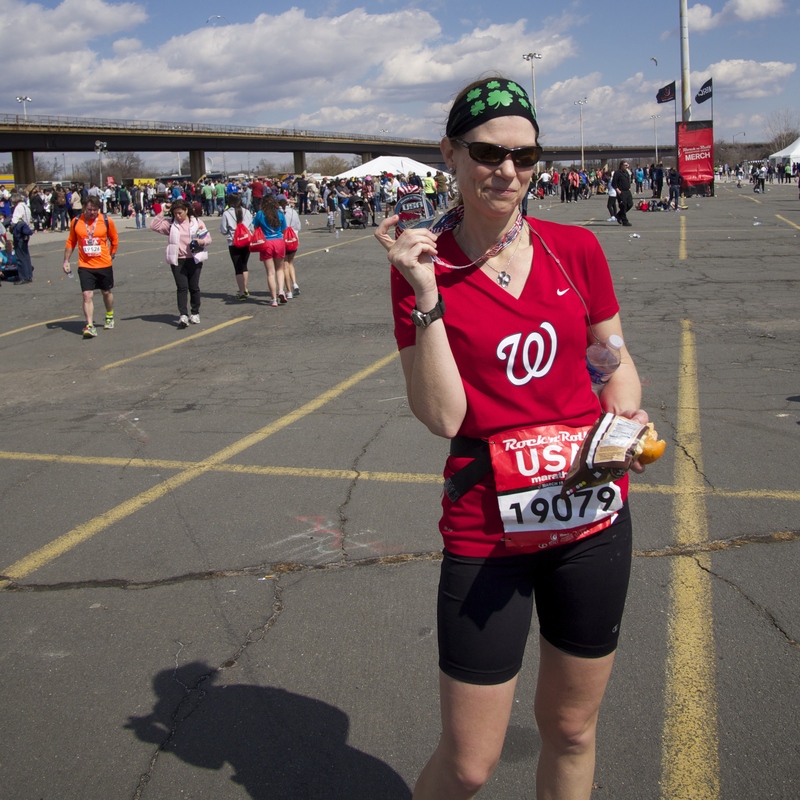 This marathon miracle meant I had 4.2 miles to go. That’s my lunch run. I mentally put myself at the start of my lunch run with my running friends. I pretended that we were all out for a slow meander to the Lincoln Memorial and back, which is the 4.2-mile loop we do almost every day. At each mile marker that followed I imagined where I would be on my lunch run, and what sorts of things we would be chatting about. It buoyed my spirits and distracted me from the plodding that I was most assuredly doing. We made our way up the long steady Minnesota Avenue hill, one of my favorite parts of this course. It is the last big challenge of the marathon, you can see the people stretched out in front of you, and you get a good downhill after you crest the top. From that point it’s a flat to downhill jog to the end. 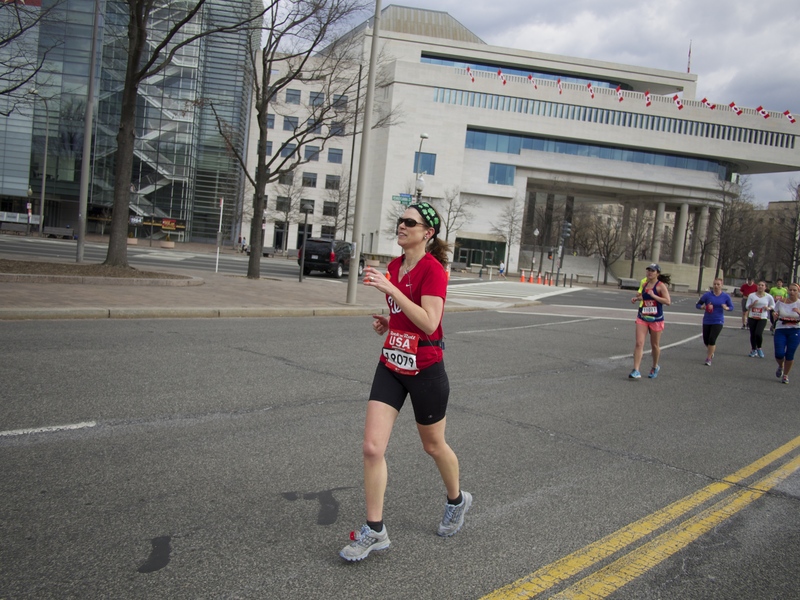 The proximity of the finish further rejuvenated me and I picked up my pace. I could not wait to cross the finish line. I imagined myself sprinting along, but I’m pretty sure it was just a slightly faster plodding that what I had been doing for the last 10 miles. I crossed the finish line in high spirits, with Felkerino cheering me and taking photos. One of the reasons I like the marathon distance is that it almost always involves confronting some sort of mental or physical discomfort. I was disappointed that I had gotten so down for what was an unusually long period for me, but glad that I pushed through. Felkerino and I rode away on our tandem and I finally got that brunch I’d been hoping for. After running 26.2 miles and just shy of 4 hours and 29 minutes of running through the streets of Washington, D.C., I felt I had truly earned it. I think that second 13.1 miles of running made my food extra tasty, too. Note: All images in this post, with the exception of the last two, are courtesy of my personal cheering section, Felkerino. * I originally titled this summary as “Four Quadrants, Many Moods,” but at mile 18 I saw a spectator sign that read “Run Hard, Brunch Harder.” It has stuck in my head and seems a more fitting title for this run. Standing Desk Diary: My Feet! What Kind of Person Rides a Surly Long Haul Trucker? Congrats! You are awesome! I love that medal! Wow! And after last week’s 200K. You are amazing. Congratulations! You earned that brunch! A 200K last weekend and a marathon this weekend? You are living the dream! Way to go! Congrats, Mary! You really gutted it out! Good job, Mary! Congratulations on the finish and beating back the marathon mental demons. Good work, that is not easy to do ! Amazing how so many physical challenges come down to a strong mind, in the end. Good for you for turning that blue funk into a big smile! The W on the shirt stands for Wonder Woman. Awesome. The way you can move between brevets and marathons blows my mind. Well done. I’m sure that was 4 hours and 28 minutes of pain. No, it is Canada’s fault.